Reviews | Baker's Mark Quarter Size 19 Gauge Wire in Rim Aluminum Bun / Sheet Pan - 13" x 9 1/2"
An essential addition to busy bakeries, cafeterias, coffee shops, and cafes, this Baker's Mark heavy weight quarter size sheet pan ensures efficiency when baking your signature confectionery delights! Perfect for baking cookies or broiling other foods, this bun pan can also be used as a cooling area when you transfer your sweet treats to it after cooking. Nice sheet pans for a great price! The do warp in the oven at high temperatures which is annoying if doing baked goods. They do "bounce" back when they cool though. Nice price nonetheless. We bought these to use as a cost effective serving tray in out Fast-Casual restaurant. Very durable, affordable, sanitary, and look good with a 9"x12" "sandwich wrap" paper on it. Use these pans for cooking and serving. Treys work well with baking and also on grill top. We also use these treys to serve and they look awesome with just a paper sheet on top of it. Bakers Mark Pans are great. I bought 4 of them in different sizes. Super sturdy. The other pans I had always warp in oven when the heat is too high. Not these! They work great for for transporting meats from outdoor grilling and smoker as well. This is my go to baking sheet pan. I have to say, it is the cheapest most durable and reliable pan I own. I have expensive ones from big name stores but nothing comes close. These do not warp and are in great shape after a year. These pans were purchased for use in a restaurant to be used in a commercial pizza oven. They are very high quality and durable. I am very pleased with the sturdiness of this product. Works well! I have purchased a lot of these for gifts for my family. They absolutely love them for baking or catering. The best quality you can get for this price! These pans have a multitude of uses in our kitchen. They are very easy to clean. Sturdy pans for the price. I’ll definirtly recommend these! This quarter size bun or sheet pan is a good thing to have when a smaller sheet pan is needed. The 13 by 9 1/2 inch size is great. This aluminum pan is well made and is sturdy. No doubt this will last in this kitchen for years to come. This is such a good buy. These pans are lovely. They have just enough heft to them to be quite sturdy and feel like a quality pan, but are lightweight enough to perform beautifully in the oven. The size is perfect for small batches of baked goods or roasted veggies. It's also an excellent size for reheating leftovers in the oven. Lined with deli or parchment paper, they even make for a cute serving presentation option! This is great for all the small needs in the oven - roasting a small amount of veggies, food for one. Its always great to have this on hand. The are about 1/5 of the price of retail stores! The perfect size for roasting smaller quantities of of veggies. We us this regularly to roast beans and have not a single complaint. The metal construction is very stout and will provide us with years of great use. Even more than for baking, I love these quarter size sheets because they fit in a normal fridge much more easily than standard half size pans, so they're ideal for rapidly chilling things down. Super shiny but i recommend going to town on them with warm water and some soap. They are great but anything aluminum should be washed well before use. I will definitely buy these again. and I recommend them. These are the sheet trays you want. Love these bun pans, we use for a variety of things in the kitchen, they hold up well after getting used several times a day, i would and do buy them again. Great pan for food service. These pans are excellent for our busy restaurant. They are heavy and durable that withstand the extreme everyday workload. Easy to clean. They also stack easily for great storage. Absolutely love quarter sheet pans and these are sturdy and affordable like I'd hoped they would be. It's the perfect size for roasting small batches of nuts like pecans or walnuts before using them in cakes or cookies. I also love the convenience of having these pans when my cupcake batter makes just over 1 or 2 dozen. I can use standalone paper baking cups and bake those on quarter sheet pans instead of having to use an entire cupcake pan for just 1 to 3 cupcakes worth of extra batter. Great product; highly recommended! We love these smaller sheet pans for a smaller portions of food items. The pans themselves are very sturdy. We have ordered dozens and they arrive in prefect condition. Package arrived in a speedy fast time, no damaged items and it was exactly what I ordered These pans are so cute and perfect for kids menu items cannot wait to use them! I actually purchased this to use as a serving trey and it worked perfectly. heavy duty and holds up to numerous uses. The weight lets you know it will not be easily damaged or worn out. These quarter sheet pans are great when you want to bake just a few cookies. They also double as trays in the kitchen...We use them for everything! I highly recommend! Because these are exactly half the size of the "half-sheet" pans that fit snugly in our ovens, we use them for baking individual portions - making double use of each oven rack. Much more flexibility for us as we cook. And solidly built! This pan is the perfect size for a toaster oven and a great price. Aluminum is thick and durable and it arrived with minimal markings. Great quality, great price. Cooks evenly, fits perfectly in my toaster oven and does a great job with cookies and brownies. I will be buying more. I like to use quarter size pans for tarts and cakes for my markets or parties. Unfortunately, I don't like to bake with these ones much. I need my tart crusts baked to certain color and texture, and so far I haven't received the same result with these pans as I have with the non-stick heavier pans. It might be they are just not suitable for what I would like to use them and are perfect for other products. They also wrap a bit. I use them mostly to transport to and sometimes to display the cakes at the farmer's markets. These pans are beasts. They are wonderful additions to my household kitchens and hold up so much better than the standard trays you get at the store for household use. Great for meals for two! I originally bought the half sheet pans and loved them so much, I had to buy some smaller ones to replace my cheap baking sheet. Used for display at my bakery. Looked really nice, they also work perfectly in place of food trays. Also bakes well in the oven. Multi-use! I love this pan, it is small put very multifunctional. I would say it could fit 3-4 split chicken breast on it with no problem. Great for prepping! The Baker's Mark sheet pan is well made and worth the money, whch is better priced and others of similar quality. I use the smaller sheet pans for both food prep and meal service. Having a barbecue catering service is a lot of fun! What's better is being able to bring the restaurant to the clients and their guests. These 1/4 size trays are perfect for every size catering event. Just enough room to make one person happy. And there is no worry about weight, as they are light and strong! This Bakers Mark Quarter size pan fits perfectly in my toaster oven. It is the perfect size for a sheet pan dinner for two.The pan cleans up nicely after use. This pen is perfect size for baking rolls. Puts out large quantity of rolls each with the perfect crust to “inside soft” roll ratio. Quarter size of this pan perfect for small bread batches. These sheet pans are great to have around the kitchen to use in various applications. We don’t cook at our cafe but we use this in our dehydrator, freezer, and fridge. I love this pan, it is very good quality. I like the smaller size too for when you just want to bake a few things you don't have to pull out the big baking pan. It is not very heavy and I have had no issues with warping when in the oven. I always put parchment paper on it when using it and I have had no issues with sticking. It is also very easy to clean. I highly recommend this pan. Bought these pans to make Rice Crispies Treats and they are the perfect size. There easy to use and clean. They are a great buy. Ordered these for our outdoor parties. Great product, excellent quality. Quick shipping. I have ordered several items from Web Restaurant and will be ording more. We use these to serve on rather than actual plates and we love them! They are easy to clean and I don't have to worry about breakage. They stack easily and are a very unique way to serve our brats and sandwiches! This sheet pan is the perfect size for small kitchens for organizing products as well as baking small quantities of items. The construction is also very sturdy. These aren’t heavy duty at all but it works ok. I use this for my warmer and it fits three in the case. They’re shallow so it’s easy to grab food from it. This is a pretty standard quarter size sheet tray. Not flimsy at all, and has a nice shine. Will scuff easily like any other aluminum item. Perfect for cooking/cooling/resting small amounts of food. this is a great sheet pan, heavy duty, does everything and then some for my private chef and catering business, just the right size a a couple chicken breast or a whole chicken. This is undoubtedly the finest baking sheet I have ever owned. Baking on it is a dream. The 9.5 x 13" size is perfect for our household gas range. We have even used it on our Pellet Grill and cleanup is a breeze. The material heats evenly and distributes it equally through the entire sheet. The material reminds me of my grandmothers old aluminum sheets from when I was a kid. We are actually replacing all of our non-stick cookie sheets with these. I am even purchasing a few for our meat processing. They are sturdy enough to hold 15 lbs of steaks at a time. Nice size pan for smaller batches. They are completing our sheet pan assortment of full, half and quarter pans. Looking forward to putting them to use. I love this size because it's perfect for baking. It's also great for if you are trying to fit a bunch of things in an oven at once. I would make sure to use this with parchment paper or some other kind of liner because otherwise things will stick. The quarter size is great for roasting small amounts of food, or for that last bit of cookie dough. They are lightweight and easy to handle, yet sturdy. The rim is tall enough to keep things on the pan without getting in the way. Easy cleanup is why I love these pans. Clean with soft materials or you will ruin them. They are great for baking especially cookies! I'm definitely gonna order more! Sturdy and cheap, a deadly combination. This quarter size sheet pan is great in combination with the quarter size cooling rack. The size is perfect for a new york strip or a nice flatiron. Also great for keeping prepped foods before using! These are great quality pans for a great price. We use the m when making multiple batches of roll varieties. They can all go in the oven together but not touch o e rub on others. Makes for quicker meal prep. i keep ordering more of these pans at work - i use them primarily for a thick sicilian pizza shell and they work great for that. i also use them at times for cake layers and often to store desserts on in the pantry station when we need the space. i definitely recommend hand washing these - and do not use steel wool on them! I use this to bake a small batch of rolls for the slower seasons. We hold our rolls in a warmer so if it doesn't move fast enough it starts to dry out slowly so it is more beneficial to bake off 6 at a time using these pans and the quarter extenders. Just right sizing. Large enough to slide under frozen casseroles. Great for oven frying 8 oz. of bacon, baking a batch of 30 ready make filo shells, toasted sandwiches and endless other uses. They recommend hand washing and I do. For the very low cost per pan I could not buy anything of quality elsewhere! Beautiful shiny finish and heavy grade quality. I use these 1/4 size bake sheets for displaying product in my bakery, it works very nice with smaller items of cookies or muffins and such. These are good durable pans. However from experience I would recommend using parchment paper with these due to the pans scratching easily. Otherwise a perfect choice for any establishment. I didn't pay enough attention to the size when ordering these originally, but I'm glad I accidentally ordered this size. They are durable, and perfect for putting subs through our conveyor oven as well as stacking pudding and jello shots in the walk in cooler. These quarter sized sheet pans are great for small jobs. They are made of the same heavy gauge aluminum as the larger pans, and are reinforced with wire in the rim, so they are very durable and clean up easily. These fit into my large toaster oven, and it is great to have a real pan for that. This sheet pan is a winner in my opinion. First and foremost it is worth every penny of the meager of the price while performing like something worth 3x the price. Will be buying more soon. This guy is super durable. I've put it through at least 20 dish cycles by now, not to mention super hot ovens, and I've had no issues with warping. You can tell it has a nice heft to it just by the weight. We use these sheet pans multiple times a day and we have been using them forever, they are just so durable and easy to clean. I've used this pan many times since I received it last week. It's very easy to clean, and seems really durable. My favorite thing has been that the angles of the corners and edged are angled and rounded in a way that makes it quick and easy to remove any food during washing. We love these sheets pans! They are affordable and very durable. We use them as our individual serving trays to plate our food on and they look great! These baker's mark sheet pans are great! For the price we had to get a dozen and we use these to freeze our own home made potstickers. They are fantastic when you don't have a lot of space and need a smaller size. these are really nice products. i use these way more often than larger size pans. they're moe versatile, they don't warp as much, AND they're less expensive to boot. they're really great. Very resistant sheet pans that are easy to clean. I am very happy with this purchase specially with the very competitive prices. I have bought very expensive sheet pans that look and work exactly like those. I like that this pan is non stick and very easy to clean. The fact that it has a wire in the rim and is not super flat, makes it easy to pick up. Very durable and made from high grade product for a great price. Only wish it were a little bit smaller so we could have used them to present our food to the customers in! Quality baker sheet that is strong and tough. Would buy again and recommend to anyone that is baking a lot. Thank you for the fast shipping! Baker's Mark Quarter Size 19 Gauge Wire in Rim Aluminum Bun / Sheet Pan - 13" x 9 1/2". Product received on time. Product and service exceeded our expectations. Pans are great quality. These are perfect for 2 people. Easy to clean, holds 2 Chicken Breasts, or 2 pieces of Garlic bread. And they are so easy to handle for an older person. They also fit in the dish washer with ease. Get a bunch and share with your friends. This quarter size baking sheet is just what you expect. It's the right size for about 6 cookies or a couple servings of asparagus. Sturdy and well made. I love that this sheet pan is so versatile. I recommend getting the complete set with rack (item #4070058) and lid (item #407PLSP1013C). This way, one pan can serve multiple purposes, save space, and the cost is extremely affordable. This is a great multi-use pan: we use them to bake/roast small amounts of food, for baked goods and for food prep and transportation. Great value and easy to clean. Will definitely be purchasing more of these pans! great great great lightweight 1/4 pan! i love this pan, I cook a lot for 2 and this size of pan is just perfect for smaller meal. I throw a couple chicken breast or a couple steak on there after searing to finish off in the oven. I love this little pan it is perfect for making small amounts of products like roasted vegies. These also work great for organizing your mise en place or for holding your kitchen tools like knives measuring spoons, etc. while doing prep work. Great quarter size sheet pan. This bakers mark brand is great quality and a great price as well. Highly recommend if looking for aluminum sheet pan. This quarter sheet pan can be used for any lunch or buffet. Just arrange everything neatly on the tray and things look so much more appetizing. Carries easily too. I have a lot of those in all sizes and would buy again. Also its very good quality. This pan is the perfect "small" pan for home use. I recently used this pan to cool ganache for truffles, and found it was the perfect size. Perfect size for smaller portions. Works in small ovens. Great for campers. Can’t beat the quality and the price is great. I have this pan in three different sizes. I absolutely love this quarter size bun pan! Just the right size for a smaller family for storing cookies, cinnamon rolls and lots of other baked goods. Would recommend especially for the price. These are such a perfect size. It makes it perfect when we do quarter sheet cakes too! The price is perfect and this is not a size you see in stores locally! Will be buying more soon! In my house we use them as plates for messier meals. I throw a sheet of wax paper on there and use them for ribs or any type of BBQ or stuff that comes off the smoker. Works great for this purpose. It's so cute and tiny! It's actually a great weight. I was afraid it would be really thin but it's not. Can't wait to try it out! I would recommend the quarter sheet pan for small batches of baked goods. Lip makes for easy handling. It is easy to clean and sturdy. Fits in most toaster ovens. Beautiful quality and finishes, we use them in our food truck as serving trays, brings an modern industrial touch to our truck. If you take good care of them they will last forever. Great small tray for quick batches of cookies and other food items. We like to use it to melt the cheese on our grilled cheese sandwiches. It's the perfect size! Baker’s mark quarter size bun sheet. This is a 19 gauge bun sheet that will not bend in the oven. It is made of very good quality. I like the stainless steel look. I love this pan it's so sturdy I have previously purchased the 18 gauge bun pan and the difference between them is noticeable I will definitely be purchasing more of the 19 gauge bun pans. Sometimes you don’t need a full sheet pan like when you are only cooking two chicken breasts. This is perfect for that! It is also great if you don’t want flavors to combine like they would on one large sheet pan. This pan is an excellent addition to my kitchen! I bought one to test and love the size and durable construction. I generally use it to marinade or season meat products in before grilling or sautéing. Definitely a good bargain! The Baker’s Mark one quarter sized gauge wire in rim aluminum sheet pans are very impressive. I would recommend them to anyone for serving cookies and brownies to baking any pastry. This sheet pan is great for cooking or roasting veggies. It cleans really well and nothing seems to stick. I am very happy with my purchase. These are heavier than I had expected--very high quality, and great for roasting all kinds of proteins and baking anything you can imaging. Okay, not great for baking pies. But you know what I mean. I keep a bunch of them around for their hundreds of uses. These pans are such great quality. I can't wait to buy all of them to complete my collection. They are incredibly sturdy and non-stick. Highly recommended! Compared to other 19 gauge pans by Baker's Mark, this pan feels a bit thicker. No complaints. Great little pan that works perfectly within a toaster oven. This Quarter size sheet pan is the perfect size for the home baker to make brownies in. The 19 gauge aluminum makes it sturdy enough to prevent warping . I purchased these to freeze homemade burgers. They worked as expected and are well make and have not warped to date. I highly recommend them. What’s great about the wire rim aluminum bun pans is that they are stackable. The raised rims also trap liquids and give support to the pan. This size is perfect for baking in small batches, and there are racks and lids to match! I have used these before as serving trays for outdoor applications. They are fantastic in that capacity! They look cool, professional, and everyone says that it is such a a clever use of a sheet pan. Well worth the money--cheaper here than anywhere else. I highly recommend! Great pans! We use them as plates instead of baking on them. They had great presentation without the fear of dropping and breaking them! Just add a deli liner for easier clean up. Love this versatile pan! It cooks so evenly and cleans up beautifully-minimal effort! And the best part even in this smaller size it can hold a couple of pieces of chicken or fish or even beef. I can also use this in my toaster oven which is such a plus. Fabulous sheet pan! I have used both the 19 gauge and 16 gauge. These are not as heavy or thick as the 16 gauge. I would strongly recommend getting the smaller gauge if you can, it is thicker. We appreciate your review, Candy! If you have any questions about the product that you are purchasing, please contact our Customer Solutions team. Great sheet pans. Good quality and light. Great for small tasks that don't require to use the full sheet pans. I also use it to store glasses and looks cute. These pans are awesome. From making small batches of cookies to roasting vegetables to serving barbecue, they are a must have for everyone's kitchen. I love them. What a versatile little pan. I use for small batches of cookies, outside by the grill and sometimes use it as a plate. Wonderful bargain. I'm buying more. Perfect pan for small batches. Uts even better with the compatible lid. We bake plenty of things on these pans including cookies. Good product and great price. As shown in the pictures these pans will bake about half a dozen cookies at once. I keep frozen balls of dough on hand in my freezer and on those nights I want something sweet but don't need 2 dozen cookies I just pop a few ok this pan and it works perfectly. I had bought a pricier item from another vendor. This worked just as well. Although, with both products, the surface gets scratched/less shiny with repeated usage, but I guess that is to be expected. We appreciate your review, Sumer! If you are looking for a different recommended product, please contact our Customer Solutions team. These are some great heavy duty pans. They are a good size for convection ovens as well as small ovens such as in my case. Absolutely price worthy and hiqh quality pans! Great to bake on, and also great usage as a serving for the more rusic feel and look, love em! These were an awesome size! A lot bigger than I expected. I used it to display fresh vegetables on the buffet table and it looked great. Exactly what I'm looking for, good product, good quality. Quarter size is what I was looking for and they came as expected. Recommended and they do the job well ! This pan is just fine. Only 19 gauge but strong enough to satisfy your baking needs. We use to bake a single calzone or stromboli. Also small batch of garlic rolls. These are great for roasting small amounts in the oven or wrapping up items in low boys or shallow depth needs as they are small yet durable too. Its a litte Smaller then we expected but will work well for when we are baking in small batches. Fits well on fridge shelfs too. These are super sturdy. The rims are also very thick, i have loaded these up with tons of veg and had no fears of it buckling. This item is a great pan we cook everything from turnovers to croissants to bagels on it. It's great for making the layers of a cake. This is a great size pan for small batches and test batches. The quality is great, the metal has no rough edges. This is a great little pan at a fantastic price. It has been really hard to find a good everyday quarter sheet baking pan. This pan certainly fits the bill. Perfect and small enough for everyday use! This quarter size pan is really nice for smaller portions when a larger pan is just not needed. Whether your baking something or just reheating in the oven its a great size. Great little pan to have on hand for smaller baking purposes. Personally I use this to bake a few filets of fish at once. For the price, having a few of these half sheet pans around has been a huge help and convenience. I will say that the pan can be a little difficult to clean crusted on food off of, so I could recommend it be used in conjunction with a liner of some sort (foil, parchment, etc). Tend to lose their shiny finish when washed in a dishwasher, which is good to note. But even so, they perform just as well. The size of this pan is great. We use it as a sample tray at our bakery. It also fits perfectly in our small convection oven. Some advice, don't put water in it and put in the oven, it permanently discolors it. Very sturdy and easy to clean. It could rust so after washing, dry in the oven every time. Good use for freezing bagged liquid items. I cannot complain about these low-end sheet pans sold here. They're perfect for the price if you're on a budget. These 1/4 size pans are great for a few biscuits or maybe some link sausages. No problems with warping yet. The rim makes them easy to carry confidently. I have used several sizes of this pan. I love what I am getting for the price - it's a solid get-r-done product - it does scratch a little easily; it seems that even my classic yellow and green kitchen sponge can leave fine marks on the pan from scrubbing if i'm not careful. These are definitely not non-stick, but just throw a piece of parchment paper on them and you're good to go. My favorite thing about them is that they don't warp/bend in the oven when it gets hot like some of the cheaper store bought pans do. They won't stay pretty and clean for long, but I know they'll get the job done. Good quality. Love the fit of this pan. Will not pop in the oven as it is very sturdy. Have not seen any rust. will recommend to buy. I have the eight size pan and I wanted this for my actually oven! I use it to bake things that are for either one or two people and save time and energy by having more than one of these. I actually plan on buying a few more of these simply to give at Christmas as to stop having family members ask me about them all the time. Love that these were wrapped individually to prevent scratches. Great price and arrived in good condition.These are the right size for large quantities of pastry. i have these in most of the sizes. These pans are perfect for my tiny oven! Great quality too! And I love the price break for ordering more :) that helps when you need save! I've used these for baking, for roasting, in the freezer and just to hold mise en place and they're super sturdy and hold up really well. I bought a big batch on a whim and I actually wish I'd gotten more haha. Living in NYC, my little 20" oven only fits quarter size pans. I turned to Webstaurant because options were limited elsewhere. I own a ton of these and run them through the dishwasher (which you really aren't supposed to) but they hold up extremely well. I recently ordered a new batch of these because I wanted a clean, untouched set for when guests come over and presentation matters. We have 20 or so and love them. We use these every day. I love using these as a plate for serving BBQ or Lobster! For brownies, cookies, biscuits, rolls or whatever you want to fix...these pans are perfect. They are more durable than any I have purchased. I am very pleased with them and have ordered multiple sizes. I loved the half size pans so much I had to try the quarter! They are perfect for a couple of chicken breasts or a few cookies. May end up with more of these, too! This pan is a good weight and feel. It does the job as expected and I am confident that it will stand the test of time. The problem I encountered and the reason for only giving it 3 stars is because of the discoloration that appeared after the first use. The pans were shiny when I received them but after using and washing, there were these black streaks and dull marks on the pan. There is no way to get them shiny again (I posted photos showing these marks as well). It looks like despite how much I clean them, the marks aren't coming out and thus, the pans look dirty when they are not. Thank you for the review, Tianne. We're sorry these have discolored. As this is not supposed to happen, A Customer Solutions Representative will contact you soon. These little quarter pans work wonderfully in the advantco countertop oven we use for in shop baking. They work well. Clean up easily. No problems yet! We use these in our electric smoker and it sure saves cleaning time on the smoker when the meat is done! The pans are so versatile I have many in different sizes. This is more cost effective than using disposable pans. Bought 12 of these to use for more casual dinner parties. Served pulled pork sandwiches and ribs and these were the perfect size to hold all of the food without things being too crowded! Guests loved the idea and want some for their new home. Will definitely order these and other products again!!! These pans are great. We use them to cool down chicken quickly since the aluminum gets cold really quickly. No complaints here. I like that they are the same width as a regular sized baking sheet so they still fit on all of our racks. I always get my sheet pans from webstaurant, the quality is great and the bundle prices are wonderful! This quarter sheet pan works for quarter sheet cakes although its pretty shallow so I always bake two layer and stack. Really great trays. Sturdy but not too heavy to carry when full. They hold up really well. Easy to store in fridge because they are flat enough and easy to put in oven and bake with. Standard sheet pan, no complaints. I use it at home for personal use, can fit a whole chicken cut in half easily. Has been holding up well and does a good job of distributing heat without hold heat too much. These pans are workhorses, but after many uses I can see that they will not last forever. They came shiny and in a good size for me, so I am happy to have them. I'll get my money's worth and I would recommend protecting them with parchment paper and/or foil when doing messy or oily things. That will extend their life. This works great in my toaster oven when baking cookies. The one that came with my oven isn't nearly as nice or sturdy as this one. The pans arrived very shiny, but scratched up and dented. WebRestaurant customer service was amazing and credited me the purchase price. I thought I could still use it, but both buckled and warped when I baked cookies for my children. Now I just use it to carry a few small pieces of meat to and from the grill. Thank you for your feedback, Erica! We are sorry your pans were defective, but are glad we could issue you a credit for them. If you have any questions please let us know! Wow, what a great value for these. They're very durable and perfect for any use, but at this price, they could be disposable and still be worth it. This sheet pan is great. It is durable and sturdy but isn't too heavy. It's easy to wash and works great in our commercial kitchen. These are sturdy but not overly heavy. Worked great for self catering a dinner and now work great for cooking at home. I put one in my dishwasher to see what would happen and it discolored the pan but still works fine. This bun pan is great but unfortunately it wasn't what I expected to use it for, however I'm still able to put it to use. Unsure as to how sturdy these sheet pans would be I ordered two of them to fit my new york city sized oven and boy am I glad I ordered these. They are the perfect size, sturdy and have a nice rim to hold. They have seen more use than my normal sheet pans. I do have trouble getting all the water out when I wash them out of the rolled edges but setting them on the counter at a slant seems to do the trick. works well for cooking bacon or chicken tenders, we use wax paper on top to help against food getting stuck on there, but holds up against the hottest and worst of cleanings. 19 gauge may sound thin, but it isn't. This is a very thick sturdy baking sheet that won't flex and drop your food when you remove it from the oven. This item goes perfecting the convection oven. It is easy to clean but don't put it in the dishwasher. It fits about 6 large Texas toast. This is a good plan to use for just about anything. I used it with my 2 inch pan extender and I use it for just toasting things as well in the oven it works out great! These are great little pans. We purchased for use in our convection oven and these have held up pretty well. They are easy to clean, and have a thick reinforced rim so the won't warp. Great price on this pan. It's alot more heavy duty than I would have thought because it was so cheap. It is holding up well! Great pan for the price. Pairs great with the quarter size counter top oven. Hold up very well and don't warp after use. They also work great with parchment liners. This Quarter Size 19 Gauge Wire in Rim Aluminum Bun / Sheet Pan is very well made and small enough for Brownies. I will buy again if needed. Great price. These are excellent quality pans and an incredible value. They are very durable and the price is much lower than what you will pay at the local department store. I love all the different sized sheet pans that WEB sells, and this is no exception. This is perfect for baking just a few cookies or for roasting veggies for two people. You can also use these as trays in the kitchen...A very versatile product! The Quarter Size 19 Gauge Wire in Rim Aluminum Bun / Sheet Pan is great! it feels super sturdy in hand and fits into my counter top convection oven perfectly. I bought these to make petite fours for my daughter's wedding. I also ordered the matching lids which made it easy to transport the finished cakes. I was a little skeptical that an inexpensive pan would hold up without buckling. I have used these pans several times a week over the past few months and they still look brand new. 1/4 sheet pans always seem so cute and little to me, almost too little to use. Then I run out of them quickly because they always have something on them. I use these mostly for scones and other things that I need small amounts of. Love these pans. Really handy, especially when cooking for one. These are pretty sturdy and easy to store. They're also easy to clean! One did arrive a bit dented, but it works fine. This quarter size sheet is the perfect size for roasting or baking small amounts of food. The sheets have a lip around the edge of which makes it easy to handle and they are very, very durable. These are excellent quality pans that will last for a long time. Excellent value. I use this sheet pan mainly to bake cookies and roast vegetables. It has never deformed or warped in the oven even at 500 degrees. These pans are heavy duty and of very high quality. We use the quarter sheet pans for scones and other small things that need to be stored in the freezer. They stack up and fit within the half sheet pans nicely as well. These are great-I love how they fit so much, go easily from freezer to oven and fit everything. They also don't warp, which is perfect for baked goods or roasting nuts. Perfect size pan for left over dough. you know, when you portion two dozen cookies perfectly and only have three leftover...who wants to use a full size cookie sheet for 3 freaking cookies? These are very handy just for that. I plan on purchasing pan extenders and attempting cakes or brownies in this size pan. Bought this for personal use to replace an aging toaster oven pan that was very old. This is really perfect for the toaster oven and would definitely buy again. I bought this pan along with the plastic cover. Perfect fit and great product. Prepare your goodies in it, pop the cover on it and take it anywhere with confidence. Both items clean up well and work together fantastically. Im a happy camper. Excellent quality and price. Love these for the smaller bars when we only need half of a recipe. Also nice for presenting food on for serving. These baking sheets are very versatile and multipurpose. I try not to put things directly on the pan when I use it to bake because I also like to use it as a serving tray sometimes. These fit perfectly in a smaller oven. Haven't had any issues with them so far, they look really nice just try not to use something abrasive like steel wool when cleaning or you will create scratches and swirls. Product arrived on time and well packaged with no damage. These sheet pans see moderate daily use baking desserts for our dessert bar. Well made and easily cleaned. Excellent product. These are awesome sheet pans. Very heavy gauge aluminum. I have not had any warp or dent on me yet. I keep several on hand to use for various things. Great for home cooks especially. Great pan. We paired it with some of the roasting racks to cook off s,smaller quantities of meats/fish at a time during service or for medium sized parties. Also works well with baking for smaller quantities too. Excellent little pan. Conduct heat well, look nice, clean up easy, and don't retain a ton of water in crevices after washing. The only downside, the stickers on these little guys took a LONG time to get completely off... i've spend more time trying to remove them then actually using my pans. perfect!! the size and the durability of these pans are great. easy to clean. super fast delivery on these pans. I will be buying the racks that go in these for baking other things. I like to make layered sheet cakes with these and I don't have to cut much off the cake. These are great for cookies too. We bought these tray to use as a serving tray. They are very nice and sturdy. I receive many compliment from the customer! They are also good for baking. Loved this quarter sheet pan. Has worked great with the other quarter sheet pans that I mainly use to flash freeze stuff in the freezer. I use this pan for roasting more than any other pan i have ever owned. def recommend getting this. Not to big not to small. I didn't think I would use this small pan as much as I do. I use this almost every day! It is good for toasting bread under the broiler and other simple tasks. It is just as sturdy as the half size pans which I have purchased from here. These pans are some of my favorite at home pans! We use them to roast small amounts of vegetables, bake small quantities for kids and to transport different items to and from the grill. What a great buy for what you get! These are a nice size. They are fairly small. You can bake on them, but I also like to give them to the kids to decorate sugar cookies - the rim keeps all the sprinkles contained!! And the small size makes it possible for the kids to sit next to each other. This little pan is so convenient! Great for home use to bake a single fish filet, a few cookies from refrigerator batter, or a six pack of biscuits. We use baking paper sheets for easy clean up. Love this pan. Sturdy design and even heat. I have a tiny oven in my apartment, and this thing now gets as much work as anything in my kitchen. Perfect size for smaller food prep. Use these all the time and love them! Only wish two fit exactly in a half sheet pan, it doesn't quite work the way you'd want it to. This is a great pan with a deep rim. It did not match with previous quarter sheet pans that I had but other than that it serves its purpose and is durable. Never had a commercial sheet pan till now. What a big difference. I bought cheap ones from stores and they buckled up when in the oven. Now everything bakes evenly. Which is great when baking cookies and pies.Great prices also. I also purchased the footed draining grate to fit sheet pan after I baked cookies to store on. Hey this review is just for what I use it for that said I don't use it for baking or atleast haven't yet..these are my for Sevice/eat in trays..soild edgy look that brings the smiles..fits a rather large sandwich and a side with ease..excellent product. These sheet pans are a perfect size to cook something for a smaller family. I love that I don't have to whip out my large baking pan for a small chicken and some potatoes, or to roast some nuts in the oven. They are also very sturdy and I think they will last us a long time. Highly recommend these, plus you can't beat this price. These work great for holding smaller pastry items such as a quarter sized sheet cake so you can save space in the refrigerator instead of putting a small cake on a half size tray. They're also useful for carrying out pieces of cakes from the kitchen to the display case. I love this little pan. At first I only purchase three thinking I wouldn't really use it much but I'm always reaching for one and get bummed when they are being used. They are great for storing prescooped cookie batter in the freezer, as a plate for decorating cookies, holding tools, and even as a plate! I love using them as a plate, place a whole lobster, some corn on the cob, and some garlic bread and it's a serving plate for one, perfect for catching all the juices! I'm going to purchase more right away! Don't make the mistake of just buying one or three, get a dozen you'll use them! These little pans are nice for browning single orders of garlic cheese bread and for toasting small amounts of nuts and seeds. They not too thin or cheap feeling at all. I bought them for work and now want a few for my home kitchen. They are sheet pans and they do their jobs. They are really easy to clean. Only one complaint, the stickers on the bottom of them are really hard to get off. I purchase two of these sheet pans and they are beautiful. Shinny and sturdy, easy to clean. If your is old and stained, throw it away and get these ones, they are inexpensive and last longer than the ones at the department stores. This works well in my large toaster oven and my convection oven microwave. It cleans well in the dishwasher. I have to cut my parchment liners in half and the fit well. We are very happy with these quarter size aluminum sheet pas and the price can't be better than what we find at Webstaurantstore. We would recommend this product. Functional sheet pan. Not heavy duty or of the highest quality, but for the price it can't be beat. If you're a serious baker, consider investing in a higher quality product. But if you just want something to get the job done, this is a great bargain. These pans are very sturdy and such a great price (easily half of what they charge at my local restaurant supply). This size is perfect for cooking up a few apps or a couple pieces of fish for dinner. Wow. These trays are a fantastic deal. Most reviewers are pleased with them and so am I. Perfect for the toaster oven too. Will be getting more for gifts. Great, great pans. We use these in our children's cooking school for so many different applications. I would recommend these to anyone needing a smaller sheet for smaller applications. We have even baked small thin cakes in them! Great little trays. I was surprised at how heavy weighted they were. Perfect for my small batches of cinnamon buns. Planning to purchase a couple more for when I need to make a larger batch. This product is awesome I love how versatile these are. We use them for buns but also to heat cheese fries in the oven or anything else like that. I love using these for smaller bakes as well as prepping meats or vegetables. In a kitchen, organization is key and these little trays are great for laying out ingredients as you get ready to cook. The quarter size sheet pan is great for multiple uses. We used it the other day for fish and have another one that we use more for baking. Great size!! This quarter sized aluminum bun pan or sheet pan is a very high quality sheet pan. I am confident that it will stand the test of time! Love these pans. Just the perfect size for two empty nesters. They fit in our dishwasher and clean up like a dream. And they do not rust like those non-stick pans. This aluminum Bun / Sheet Pan fits perfectly in my convection oven. I use it all the time to make appetizers during dinner parties. Great quality finish and material. This 1/4 sheet pan is sturdy, well made, easy to clean. With a quick brush down it easily cleans in the dishwasher. My kids use it a lot for heating up fries and snacks like pizza rolls. I just like it because they make my life easier. These are pans that should be around long into my old age. I love these. I use them from baking cookies and cakes to cooking meat, pizzas, calzones and potatoes. I have a vintage confection oven and these are the perfect size for that, but I can also use them in a regular oven just as easy. Very versatile, easy pan to use. One of the can't do without items in my kitchen. This 1/4 size sheet pan is used in the bottom rungs of our oven to catch any spillage of cheese or sauce from the pizzas cooking directly above. Thise 1/4 size aluminum sheet pans are a great companion item to the countertop convection over I ordered from webstaurantstore! Very sturdy and they seem like they will hold up for a long time. good quality pan! price is unbeatable. worth their price and more. allows you to make a single layer of a quarter sheet cake with out waste! This is a sturdy pan, Well made with solid construction but scratches easily. It is easy to clean with warm soap water and a brush. Great quality comparable to brands costing twice the price. These are perfect size for a large convection toaster oven. We've been using these in our concession business. No problems with warping and they hold up well in both the oven and the dish pit. This is a great buy. It's the best price around and very sturdy. While it stains and scratches easily, it still works just fine, so I don't mind. The pan is a good size for me, it is just me and my daughter. I really like the quality. It is not flimsy or cheap. Good sheet pan that gets the job done at a great price. I would buy these again just because of the great value and it is what it is, a great sheet pan. These pans are great for baking. The cooking surface cookes evenly and cleans up very well. We either grease them or use pan liners to keep them in great shape. Very nice, heavy, quality baking pan. Its 1/4 size to fit the smallest commercial ovens. It is smooth and easy to clean. No sharp edges. The price of this product is incomparable.. The quality is far apart from what I brought before at my local bakery story and the service of these site made it a breeze to shop. Funny story - I thought I was ordering the correct size for my oven; however I mis-ordered quarter sized instead of half sized. However we have found these to be perfect for smaller items. The pans are very well made and clean easy. Because they are smaller more foods can be cooked at once and they take up less room in storage. I will be ordering additional ones. Quarter sheet pans are essential. These pans are great quality. Very sturdy and a great price. You can't beat it. I use them for everything from reheating items to plating. We bought the quarter pan to use in a toaster oven. Since there is no handles which are so common in most home pans, the commercial version worked perfectly. Easy to clean and stacks well. Quarter size sheet pan is cute and adorable but also practical and all I need at times. These pans are durable and ready for lots of use. This is a good pan for the small jobs you have in the kitchen. Great for baking a small batch of cookies or just use it to hold your prep work as your cut it. Overall a nice buy for the money. I love these pans! i find myself using them more than the half sheet pans. i use these to toast coconut on pre cut aluminum sheets. They fit perfectly. Study metal too. The small size makes it perfect for small orders. I can run small orders of chicken wings through the oven without taking up space needed for pizzas. Excellent price & the quality is even better. We actually use these in our bakery for display purposes. They are heavy duty enough for baking too. Thick and durable, yet lightweight. 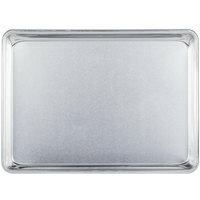 These are high quality pans and the perfect size for smaller uses when you don't want to use a full (or half) sheet pan. These are the best little aluminum bun sheet pans I have bought. They are perfect for making brownies, bars, etc..and so many other uses. Will buy again. Love this 9" x 13" Quarter Size Aluminum Bun / Sheet Pan for small jobs; whether in use in my normal kitchen oven or for use in our travel trailer. This size is not always easy to find in retail. Bake my pecan bars in these and I could not be more pleased with them. They had an even browning to the bars and came out of the pan easily. Great, great quality for such a cheap price! I have four, but will definitely be back for more. Browns very evenly, and very sturdy. I line them with my 12x16'' parchment paper, cut in half. What a deal! My only real regret is that we didn't buy more. Next time I order I plan to stock up. They are so much better than the price implies. I use these smaller sheets all the time for the narrow half of my double oven. They are perfect for small batches of anything, They clean easily and stand up to repeated use without denting or scratching. Take care of them, and they'll last forever. Love! Love! Love my 1/4 sheet pans! I ordered two and they are a nice heavy grade aluminum. They cook nice and even. I even got one for our camper! Good quality pan for price paid. Like the smaller size, sometimes the half pans are way too large. Great for baking a few items, recommend lining with foil. These pans are a good size for smaller amount of baking. I love using them to make my Focaccia breads. I just grease the bottom of the pan before spreading the dough on it and after baking it comes out clean. And I also use it for making Candy Bark and Brownies, making sure to line the pans with parchment or wax paper. If you want a bigger pan, I recommend using the 1/2 sheet size pan. These are great for cooking small single items. Like single loaves of bread. You can even use these as a large sizzle platter! Very convenient. The quarter Size Aluminum Bun / Sheet Pan Is the most popular size for our cakes.It is easy to clean and dosen't stick .It's 9"x13" We hand wash dry and when done for the day put paper towells between the pans. This sheet pan is really sturdy and durable. It's the perfect size for a batch of Croque Monsieur. And it's very easy to keep clean, even broiled-on cheese comes off easily (this size fits in my divided sink, unlike half-sheet pans that have to be washed using the see-saw method). Am here to buy 3 more of these. I love these Quarter size aluminum bun pans. my cookies came out great and evenly cooked. I will be ordering the half sheet pan size next. This great product and the price was just a good! These are handy for when you need something a little smaller than a half-sheet. I bought them for a convection tabletop oven that they unfortunately don't fit, but kept them because they're sturdy, well-made and I have some recipes that are scaled to this size pan. i wanted to eventually change all my baking sheets to aluminum since it bakes more evenly and this was a great gateway pan to test if aluminum is for you since it is smaller than your standard baking sheet. it is sturdy and durable. bakes evenly. Great aluminum sheet pan! Very lightweight but heavy duty! A cant be beat price!!!! Works great with parchment paper and/or cooling racks! Great for cookies or roasting meats! These pans are heavy and nice. They are the perfect size for my application and I am finding more uses for them everyday - wish I had bought a couple more! These are the perfect size, since in a regular oven you can fit two of them side by side on a rack. There is no rocket science going on here, just a very affordable quarter sheet pan. i love this pan.its perfect for cakes and brownies. easy clean up and very sturdy. i assumed it would be flimsy for the price. i was wrong. Very nice heavy duty pans. At a very reasonable price. These pans are great for making half sheet cakes. I would recommend them to everyone.